When I re-read the March 16, 2015 story in my print copy of The New York Times (we subsribe to print and on line), I almost shouted out loud. The only thing missing from the patronizing version of the Chuy Garcia story in the Times three weeks before Chicago votes would be a picture of Chuy wearing a sombrero with one of those big smiles that used to get pasted on the "Frito Bandito." Clearly, the Times is continuing to present its "news" from the point of view of the White House and America's ruling class. -- And the "Chuy" the incompetent, on the other. Rahm's negative campaigns have always been his speciality, and so the negative side ignores the fact that Rahm never presented the city with a "program" but can now demand that JEsus "Chuy" Garcia have a complete perfect program immediately, NOW! And the New York Times ignores the news and prattles the party line, revised. 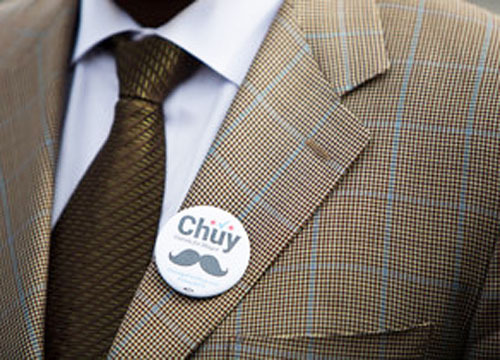 The carefully cropped photograph that accompanied the March 16 New York Times Chuy story identified the person wearing the now famous "Chuy" button as "a voter..." while ignoring the fact that the "voter" was an Ivy League business expert with extensive Wall Street experience who is one of Chuy Garcia's prominent supporters in the Black Community -- Jonathan Jackson of PUSH. Apparently the Times didn't even ask the black people with Chuy who they were, why they were there, and what they knew about Chicago's school closings and the socio-economic impacts of the policies of Chicago Mayor Rahm Emanuel.In so doing, the Times can even ignore the facts of the photographs it used with the story turning Rahm's opponent into a smiling semi-competent, and even ignoring the fact that one "Chuy supporter" happened to be the son of Rev. Jesse Jackson, who had just announced, surrounded by a group of Chicago ministers, that a large segment of the leaders of the city's Black Community were supporting Chuy. The guy in the picture was Jonathan Jackson, son of Jesse Jackson and leader of PUSH. But since that's not the story line pushed now by Rahm Emanuel, that's ignored by The New York Times. What is the "news" in America's "Newspaper of record" when a mayoral candidate in Chicago makes a clear statement about community destruction caused by school closings in one of the nation's poorest communities -- accompanied by leaders from Operation PUSH and the community itself? Well, the "news" according to The New York Times is whatever Rahm Emanuel says it is. In this case, Jesus Chuy Garcia can stand outside a South Side school with Jonathan Jackson of PUSH outlining how Rahm's school closings helped destroy black communities -- and as far as the Times is concerned the agenda continues to be the agenda of Rahm and his White House buddies, and not the "facts on the ground." CHICAGO � When asked for his position on the pressing issues facing Chicago, Jesus G. Garcia, the man trying to unseat Mayor Rahm Emanuel, often has an answer � and sometimes more than one. When Mr. Garcia was recently asked what he would do about the red-light cameras that endlessly irk Chicagoans, he said he would keep some of them. But almost two weeks ago, he had said he would get rid of them all. On the nearly 50 public schools that Mr. Emanuel closed during his first term, Mr. Garcia initially said he would reopen some of them. Later, he said he had �not committed� to such a move. As recently as January, Mr. Garcia said he opposed using public parkland for an Obama presidential library. Then this month, he reversed course, saying he would support using parkland for a library. Chicagoans are getting used to seeing Mr. Garcia bounding around the city with a wide smile and peppy good cheer. He presents himself as a warm, inclusive alternative to Mr. Emanuel, nicknamed �Rahmbo� and �Mayor One Percent� by critics who say he is abrasive and insensitive to the needs of the poor. What voters are not getting is a clear sense of where Mr. Garcia, 58, stands on many major issues, particularly what his plans are to improve the city�s precarious financial condition. Mr. Garcia, known as Chuy, is counting on disaffection with Mr. Emanuel, particularly among black voters, to give him enough support to win the runoff vote on April 7. The ad includes clips of Mr. Garcia hedging on the details of his budget plan. Stung by those attacks, Mr. Garcia released a plan on Friday outlining his approach to Chicago�s budget, saying the city could save money by making government agencies more efficient, by consolidating costs and reducing investment fees, and by revamping the way the city pays for economic development programs. Defeating Mr. Emanuel will be a tall order for Mr. Garcia, a county commissioner and former alderman who came to the United States as a child, speaking no English, and got his start in politics as a community organizer in a heavily Hispanic neighborhood on the West Side. He forced a runoff by capturing 34 percent of the vote in February, to Mr. Emanuel�s 45 percent. In a largely Democratic city, Mr. Garcia has attempted to move to the left of Mr. Emanuel, who served in Washington as a top aide to the last two Democratic presidents. Mr. Garcia has garnered the support of the Chicago Teachers Union, and received a coveted endorsement from the state council of the Service Employees International Union. He has spoken in favor of replacing the appointed school board with an elected one, a move that he said would �give the school system back to the people,� and promised to put 1,000 new police officers on the streets to stem the gang violence that has torn through neighborhoods on the South and West Sides. In a poll released Friday by The Chicago Tribune, 51 percent of voters said they supported Mr. Emanuel to 37 percent for Mr. Garcia. Mr. Garcia, left, with former Mayor Harold Washington, center, and Cesar Chavez in 1985. Rosa Alfaro, 74, said she was not sure how Mr. Garcia would fix the pension crisis, or pay for the new police officers he has promised to hire, or improve the struggling public schools. But she is willing to give him the benefit of the doubt. Mr. Garcia immigrated with his family � his father was a farm laborer and his mother a factory worker � from Mexico to Chicago�s Pilsen neighborhood on the West Side when he was only 9 years old. In high school, he became interested in civil rights and social justice, �hanging out with other kids at school who were talking about racism and prejudice and the importance of standing up against these things.� One of his first tastes of community organizing came when he and other students became disgusted by the condition of a local movie theater, where carpets were sticky with gum and soda, the restrooms were filthy and rats roamed freely. The manager spoke with Mr. Garcia and agreed to the protesters� demands to clean up the theater. �We felt pretty good about it and I think were inspired to continue organizing efforts,� he said. He studied at the University of Illinois at Chicago and, in the early 1980s, delved into local politics, meeting Harold Washington, the first African-American mayor of Chicago. David S. Schaffer, Mr. Garcia�s largest individual donor, said he and Mr. Garcia worked together on Mr. Washington�s campaign in 1983. After serving on the Chicago City Council and in the Illinois Senate, Mr. Garcia went back to community organizing, founding a nonprofit organization, and in 2010 won a seat on the Cook County Board of Commissioners. But Mr. Garcia�s wife, Evelyn, said she had instantly agreed. �I said: �Let�s go, baby, let�s do this,�� she said in an interview. In three debates, the first of which will take place on Monday, Mr. Garcia plans to explain his positions further, he said. Many Chicagoans say they will be watching closely. John Mack, 76, said he was still considering both candidates, though he enthusiastically voted for Mr. Emanuel in 2011.